The dancing may have started right after the first kiss. I’m honestly not sure, but I just have the memory of seeing someone dancing somewhere at all times. Tara + Sayan’s Arlington Estate Wedding was a toughie. Not because it was hard to film or because we didn’t have great material. But because we were just spoilt for choice! When we met Tara and Shayan, they said that they wanted their video to show everyone having “the time of their life”. And their guests certainly did. But when it came to reviewing all the footage, it became clear that this was a wedding with so much more. It wasn’t just a day of dancing, partying and good times. It was a day full of emotion, beautiful moments and sincere words. And we couldn’t ignore those. There were 7 or so really great speeches at Tara and Shayan’s wedding, any one of which could have formed the base narrative for this film. Normally we hope for one or two good speeches, but this was an usual case where EVERY speech was amazing. Grant and I were stood by our cameras totally absorbed throughout. Tara’s maid of honour gave us something extra special. We loved how she had an inside perspective on the beginnings of the relationship and how it developed. This gave us a great base to tell a unique story and give a real sense of their personalities. The emotion in her voice made it clear how close she and Tara are and how much it meant for her to find someone like Shayan. 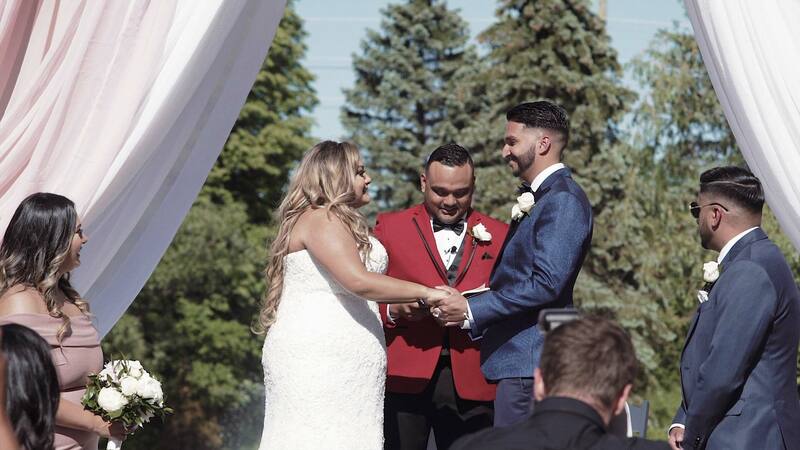 Once you understand a little more about Tara and Shayan, it adds weight to their vows. You have more idea of where those words come from and why Tara just cannot hold back those tears! And then we were able to follow it up with words from both families, showing just how close a bond had been formed. I love how Tara and Shayan invested so much of themselves into the wedding day. A Wedding can be a kind of mirror to your personality and the more that you put in, the more that we (as outsiders) can learn about you. Besides the charcuterie, oysters and elaborate decor, my favourite detail has to be the custom jacket that Tara had made for Shayan. She surprised him with it right before the reception entrance and it was another personal moment tucked between proceedings. This is a great reminder that a wedding day isn’t just about the ceremony and party. There are so many great opportunities to introduce thoughtful touches like this.